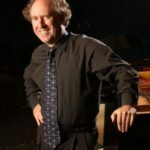 On Monday, February 27, 2012, world-renowned pianist Jeffrey Kahane performed for an enthusiastic, limited-seating audience of 60 on the Orcas Center OffCenter Stage. Kahane has frequently appeared in the annual Summer Festival of the Orcas Island Chamber Music Festival (OICMF). 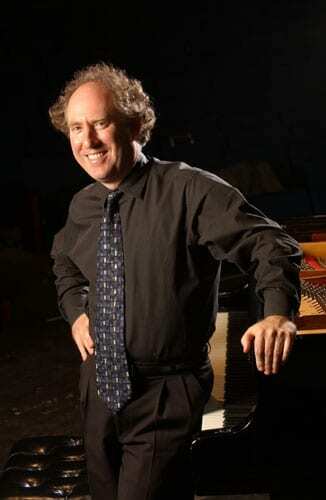 He is conductor and Music Director of the Los Angeles Chamber Orchestra. On this night, Kahane performed Bach’s French Suite No. 5 in G, G. Kahane’s Django and Chopin’s Mazurkas, Barcarolle and Polonaise-Fantasie. This Salon Concert, one of three planned for 2012 by OICMF, was followed by a “nightcap reception” for all who attended. The next OICMF Salon Concert for 2012 is scheduled for May 19 at 5 pm. It will feature violinist Monique Mead, who will be accompanied by pianist Deborah Rambo Sinn, according to Victoria Parker, Executive Director of OICMF. The May concert will be in a private residence on Buck Mountain for a limited-seating audience of 35. Tickets are available for $75. To reserve, call the OICMF office at 360-376-6636.